The First Cyclist to ride from London to Brighton! 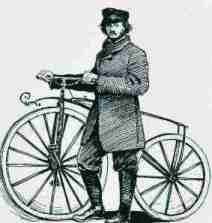 On 17th February 1869 he cycled through Croydon and Purley on his way to become the first person to ride a bicycle from London to Brighton. Read on for this interesting journey at the dawn of cycling. Learning to Ride the Velocipede. It is claimed that the first velocipede was imported from France in early 1869. The proud owner amazed a crowd of on-lookers by riding around a hall, “and when momentum ceased, instead of falling down, turned the front wheel at an angle and thus maintained at once a halt and a balance”. The first track stand!!! Unfortunately this promising start by England’s first rider of a “bysicle” (as called by a reporter of the Daily News), was followed by a number of falls. As a result the history of the Brighton Road belongs to another young man, John Mayall. He (John Mayall) tells us that the next day he took the velocipede to a quiet street. Here, he pushed and then leapt upon the machine, but it slipped on the wet road and he measured his length in the mud! Next he got a push start and managed to get as far as the Marylebone Rd where he again fell with a loud “crash!” Hence the term that we still use! It is not surprising that this bysicle fell with a very loud crash because, made from timber and wrought ironmongery it weighed in at a fearsome 93 lbs!!! Needless to say, our brave young bysiclist, after many more falls retired exhausted, soaked in perspiration and rain, and covered in mud. But undeterred! The next day was a Sunday. After this day of rest he managed to cycle to a friend’s home at Clapham. Here inspired, he conceived the idea of riding to Brighton! The following, and other quotes are taken from a 1906 book by Charles Harper,“ The Brighton Road, Speed, Sport, and History on the Classic Highway”. “The next morning Mayall endeavoured to put his plan into action, toiled up Brixton Hill, through Croydon, up the never ending rise of Smitham Bottom to the crest of Merstham Hill. There, tired, he plunged into the saddle and thundered and clattered down hill into Merstham. At Redhill, after 17½ miles, utterly exhausted, he relinquished the attempt and retired to the railway station. He lay on one of the seats for some time until he revived. Then, to the amazement and amusement of the station master and his staff, he rode about the platform, dodging the pillars, and narrowly escaping a fall on to the rails, until the London train came in”. If at First You Don’t Succeed! But the story does not end there. In less than a month from first setting bum to saddle he set off again. This time we are given a date – Wednesday, 17th Feb 1869. John Mayall and two others, all on velocipedes with their fixed, 34 inch front wheel, left Trafalgar Sq for Brighton. The party kept together until Redhill, from where Mayall went on alone. Eventually, after 12 long hours he hauled this 93 lbs of bone shaking bysicle to the sea front at Brighton. Truly an epic two wheeled journey over roads that were little more than cart tracks! The drawing is taken from an original photo of Mayall standing beside the instrument of torture on which he made that weary ride. A weird spectacle more like a Russian convict than an athletic young Englishman. A peaked cap, frock-coat, and stiff shiny leather leggings, completed a costume strange enough to make a modern cyclist shudder. But then what would Mr Harper of 1906 think of today’s pretty boys in their brightly coloured and skin tight lycra!!! The club record holder for London to Brighton and back in 5 hr 20 min 1 sec is W. Birkin (1933). The club record holder for Coulsdon to Brighton and back in 3 hr 31 min 57 secs is John Turnbull (1977).